A fantastic opportunity has arisen to purchase an extended three double bedroomed two bathroomed semi detached dormer style bungalow with fabulous loft conversion and a large sun lounge extension to the rear. Being presented to a high standard throughout and offering many appealing features. Situated to the West of Garforth in a popular and highly sought after cul de sac WE STRONGLY SUGGEST THIS PROPERTY BE VIEWED AT YOUR EARLIEST CONVENIENCE TO AVOID DISAPPOINTMENT which will in brief reveal a stunning open plan style family living kitchen, separate dining area leading through to a large sun room extension to the rear, ground floor shower room/w.c, ground floor bedroom and utility room/kitchenette. 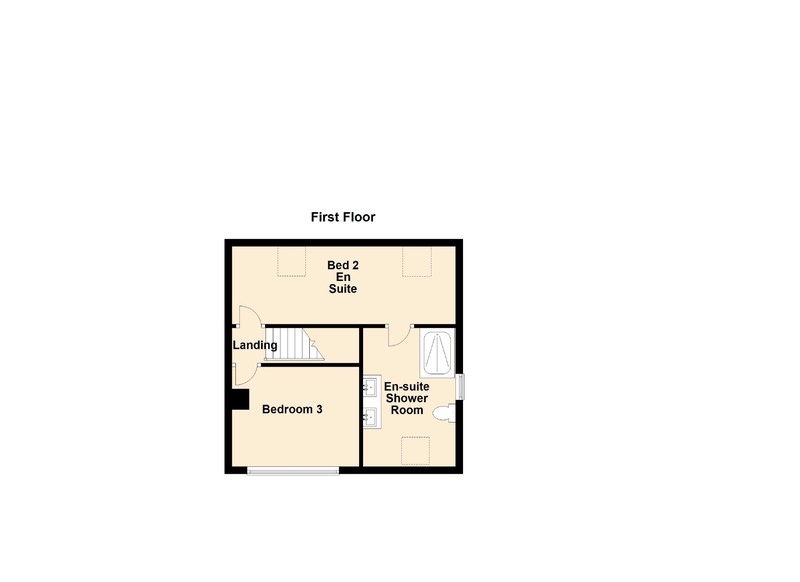 To the first floor are two double bedrooms having an en-suite shower room/wc to bedroom two. In addition the property has gas fired central heating with combination boiler, PVCu double glazed windows and entrance doors, modern high gloss fitted kitchen with built in appliances to include a double oven/grill, integral microwave, matching fitted island unit with granite work surface incorporating a four ring induction hob with feature extractor hood from the ceiling. The ground floor bedroom has a double built in wardrobe and a range of modern fitted wardrobes with sliding part mirror fronted doors. The sun lounge extension is of a generous size and has a solid pitched tiled roof with french doors opening to the rear. Upstairs bedroom two has an en-suite shower room with four piece suite including a double sized walk in shower enclosure with drying area and twin matching his n hers sinks. Outside to the front is an extensive block paved driveway providing off street parking for three/four vehicles whilst to the rear the fully enclosed and south westerly facing garden is neatly planned over two levels having two decked seating/entertaining areas to the top level along with an artificial lawned garden area and to the lower level is a paved patio seating area with artificial lawned garden. DO NOT DELAY BOOK YOUR VIEWING TODAY - PLEASE CALL 0113 2864276. Having an extensive range of soft closing modern fitted high gloss wall, base units and drawers with contrasting roll edged work surfaces and inset one and a half deep bowl single drainer stainless steel sink unit with chrome mono bloc mixer tap, built in Indesit double oven/grill, integrated CDA microwave, plumbed for dishwasher, space for an american style fridge freezer, matching fitted island unit/breakfast bar with ample low level storage drawers and granite work surface incorporating a four ring Beco induction hob with feature circular extractor hood from the ceiling, recessed LED lights to the ceiling, PVCu double glazed window to the front and side elevations, wood flooring, open through to the living area. Positioned to the front. With continuing wood flooring, two central heating radiators, PVCu double glazed window, TV point, leading through to the inner hall area. Positioned to the front. Modern style wall mounted panel radiator, decorative coving to the ceiling, continuing wood flooring, being open leading through to the sun lounge extension. Positioned to the rear. Being of brick and PVCu double glazed construction with a solid pitch tiled roof and recessed LED lights to the ceiling, central heating radiator, TV point, PVCu double glazed french doors opening to the rear, door leading to the attached utility room/kitchenette. Positioned to the rear. 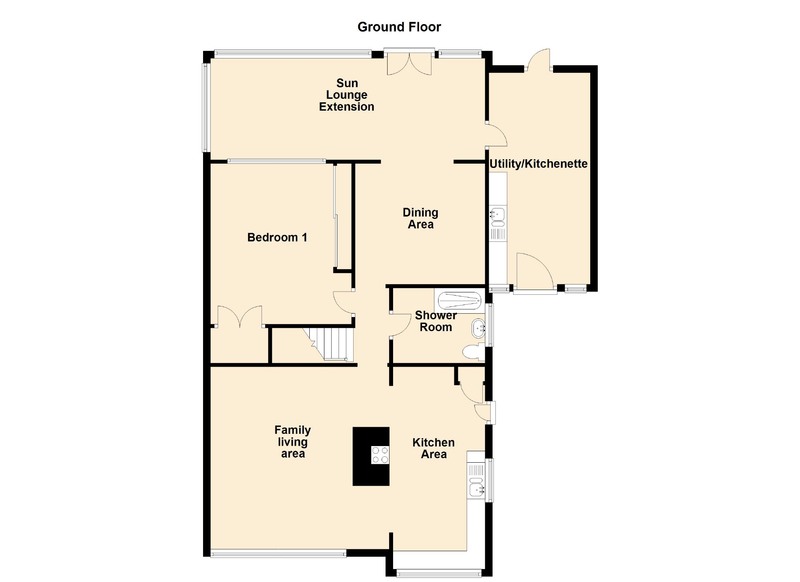 Having a double built in wardrobe to the under stairs, a further range of modern fitted wardrobes with part mirror fronted sliding doors, central heating radiator, PVCu double glazed window overlooking the sun lounge. Positioned to the rear. A modern three piece white suite comprising of a double sized shower enclosure with glass side screen, pedestal wash basin and low flush w.c. Modern style wall mounted panel radiator, fully tiled to both the floor and walls to compliment the suite, PVCu double glazed obscure window, PVCu panelled ceiling with recessed LED lighting. Positioned to the side. Having a roll edged work surface with inset one and a half bowl single drainer stainless steel sink unit and mixer tap, plumbed for a dishwasher and washing machine, built in Hotpoint oven, space for a fridge and microwave, PVCu double glazed obscure front entrance door and matching side windows, PVCu double glazed obscure door leading to the rear. Ample electric power points and lighting installed, central heating radiator, TV point. Positioned to the side. Two wall light points, two velux skylight windows, central heating radiator, TV point, door leading to the en suite shower room/w.c. Positioned to the rear. Having a four piece white suite comprising of a walk in shower enclosure with drying area, matching his and hers wash basins and low flush w.c. Central heating radiator, part tiled to the walls, fully tiled to the shower area, velux skylight window, vinyl flooring, PVCu double glazed obscure window to the side elevation. Wall mounted gas central heating combination boiler. Positioned to the front. Central heating radiator, PVCu double glazed dormer window. Positioned to the front.